Last week, I wrote about Brian Cashman’s struggle to turn around the Steinbrenner endorsed big ticket player strategy of sacrificing the long term plan to obtain short term gains. This week, I’ll look at his rival Red Sox front office, led by Theo Epstein. These are lists of iconic players for both franchises, but there’s a huge difference between the two: none of the players listed under Red Sox are still with the team. Nomar Garciaparra: Traded 7/31/04 for Orlando Cabrera and Doug Mientkiewicz. When this trade was announced, even fans outside Boston wondered what the Red Sox were doing trading a guy who had been their franchise player. But in retrospect, it was a brilliant move. Cabrera and Mientkiewicz’s presence gave the Red Sox a stronger infield defense, and the team went on to win the World Series that year. Meanwhile, Nomar went on to have a ton of injuries, and wasn’t able to get back to the same Hall of Fame level production as his prime years in Boston. Johnny Damon: Following the 2005 season, the Red Sox wouldn’t go past a three year offer for Damon, while the Yankees offered four years: thus, on went the pinstripes, and off came the long hair and beard. Damon has gone on to be fairly productive in the Bronx (barring some injury time), though his days of playing center field every day are over. Pedro Martinez: In a similar situation to Damon, Martinez was only offered two or three years after his contract expired, while the Mets came calling with a four year deal. Off he went. The Mets would get about a season and a half of productivity for the duration of his new deal. Manny Ramirez: Recent developments aside, it was clear Manny didn’t want to play in Boston, and the Red Sox finally granted him his wish. Getting back a happy and productive Jason Bay in return, and no longer dealing with Manny Being Manny, most fans would say the Sox got the better of the deal here. All four of these players have something in common: they were iconic players for the franchise, and contributed to a World Series championship. But when their contracts were up, and push came to shove, the Red Sox opted to let these players go, rather than sign them to long term deals where they’d certainly be past their prime. By comparison, take a look at those Yankee names. Jorge Posada got a four year contract in 2007, and will be a Yankee through 2011, when he’ll be a 40 year old catcher. Mariano Rivera was given a three year deal at the same time, and will also be on this team at age 40. 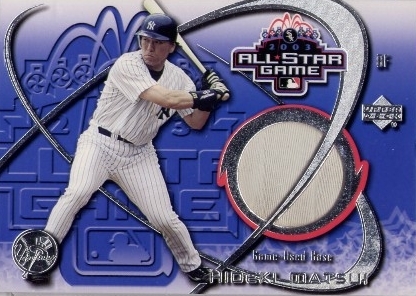 Hideki Matsui was given a four year extension in 2005, and this is his last year under contract. Thus far, Posada has already lost one year to injury, but has been productive this year. Injuries have slowed down Matsui considerably, and it’s doubtful he’ll get another Yankee contract. Mariano continues to be the marvel he’s always been. 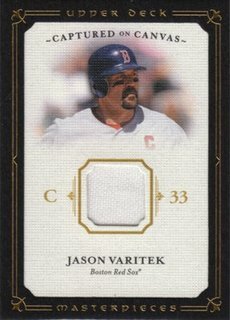 What you see here is a notable contrast in philosophy: the Red Sox are perfectly willing to let their iconic players go after their best years are behind them (with the notable exception of captain Jason Varitek), and will make creative trades or signings to bring fresh talent to the team. Meanwhile, in the Bronx, you get the feeling that management wants to ensure that certain players remain in pinstripes for the length of their career, even if it means sub-par production for a high price in that last year or two of the contract. For example, what do the Yankees do with Derek Jeter when his current contract expires in 2010? He’s made $20 million a year the last three seasons; will they match that? Going into his age 37 season, if his agent demands a four or five year deal, can they say no (especially given the huge ten year deal A-Rod got last season)? And if so, how long can you expect him to play shortstop? When he gets older, where do you put him on the diamond? If Jeter was simply “Player X” with the same stats at his age, you get the feeling that the Yankees wouldn’t push as hard to renew his contract. But he’s Jeter the Yankee Captain. I highly doubt he’ll ever wear another uniform, even if it means trying to figure out where he plays at say, age 41. Though to be entirely fair, Jeter is having a great 2009 (hard to argue with a .321 average and .398 OBP), and those trademark “intangibles” are probably worth a lot to the Yankees. By contrast, the Red Sox politely let Damon and Pedro walk away, traded Nomar when it made sense, and got Manny out of town when the situation become too unbearable. Theo Epstein and his management team understand the value of letting franchise players go when their peak has passed, and focus instead on obtaining young players, and using creative trades and signings to remain competitive. Since that 2004 championship team, “The Idiots” are gone. No more Damon, Millar, Pedro or Manny. The roster has been remade in the mold of Kevin Youkilis, Dustin Pedroia, Jacoby Ellsbury, Jon Lester and Jonathan Papelbon. Ironically enough, they’re now following the same blueprint the Yankees used to win all those championships before the century turned: put together a strong core of young players, and surround them with premium veteran talent. One of the most impressive things about how the Red Sox operate is that they always have a plan in mind, and are willing to think outside the box to get an advantage. This past off-season was especially smart: in a market where veteran players were undervalued, they signed John Smoltz, Takashi Saito, Brad Penny and Rocco Baldelli to short term, small risk contracts. These are former All-Star players mostly coming off injury years, so why not bring them on board for a season? If they come back to form, great, and if not, they’re off the books for 2010. Where the strength of the farm system is concerned, you don’t need to look any further than this season’s upcoming trade deadline. Any available player, whether it’s Roy Halladay, Cliff Lee, or perhaps Victor Martinez and even Adrian Gonzalez (unlikely at this juncture), can be had by the Red Sox, if it’s a price they’re willing to pay. And the 2009 major league roster would barely be affected. Not to say that they’re definitely going to go dump Clay Buccholz and Jed Lowrie off in Toronto tomorrow, but they could if they decided it made sense. And really, as a somewhat impartial observer (being a Mets fan), this is what makes me most envious of the Red Sox under Theo’s regime: a strong major league roster, incredible pitching depth, a huge payroll, and an embarrassment of riches in the farm system to bring up, or to swap for a key star player if the right opportunity presents itself. That’s the kind of situation any fan would hope for their team. These factors shouldn’t be taken for granted. Think about the Twins, and their inability to retain Johan Santana, or the pending negotations to keep hometown hero Joe Mauer on the team. Or the Marlins, and their remarkable ability to constantly cycle in young premium talent, but with no payroll to supplement or retain that roster. Or even the Rays, who would love to trade from within their system to make a deal for a Cliff Lee type player right now, but probably can’t because they don’t have payroll space. Not to mention my beloved Mets, and the current mess in their front office. Compared to the other 29 teams in the league, I’d say it’s Theo and the Red Sox who have the complete package right now. They have the ability to shape the franchise as they please, retain the players they want, and bring in the players they need, from either the trade or free agent markets. If karma exists, Red Sox fans are getting repaid this century for all their suffering in the last one.